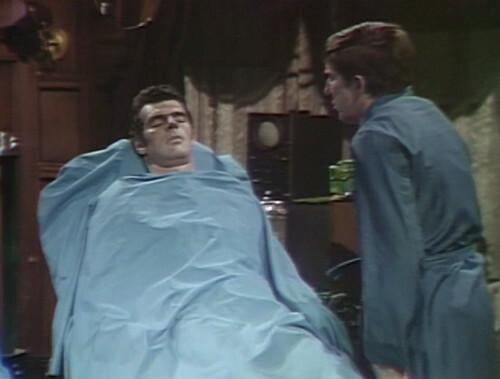 Yesterday, in my round-up of the Collinsport fashion scene, I neglected to mention the one guy on Dark Shadows who’s been breaking all the wardrobe rules — Adam, the patchwork Frankenstein. 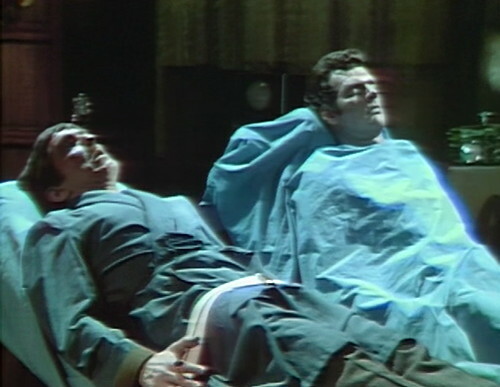 Last week, mad scientist and artisanal monster enthusiast Dr. Eric Lang tried to bring his creation to life, squeezing Barnabas’ life force out of his vampire-cursed body, and using it to jump-start the new guy. In a town with a mandatory “ties or turtlenecks” rule, Adam has brazenly flouted convention, clearly going full commando under his sheet. This bold sartorial statement has made him an eye-catching addition to the landscape, but it was also kind of a clue that he wasn’t planning to get up off the table until somebody found him something in extra-extra-large. 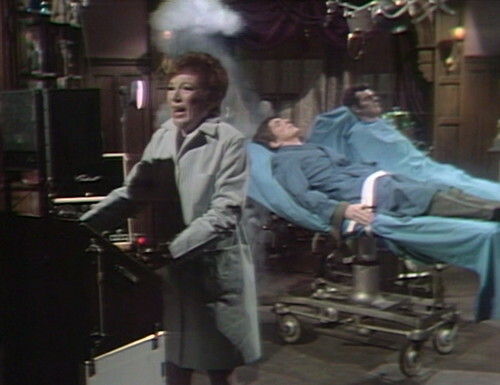 But in this episode — as Julia and Barnabas prepare to give the experiment one more try — Adam’s sheet is pulled all the way up to his chin, which means that he might have some clothes on under there. I think this might be the day we actually get this dude up onto his feet. I mean, not right away, obviously. There are the usual opening ceremonies first. Julia is at Dr. Lang’s house, and she’s supposed to be reading his journals, preparing herself for tonight’s dark ritual of summoning. But she’s the latest character caught up in the Dream Curse, which is a whole other storyline that I don’t even want to talk about. 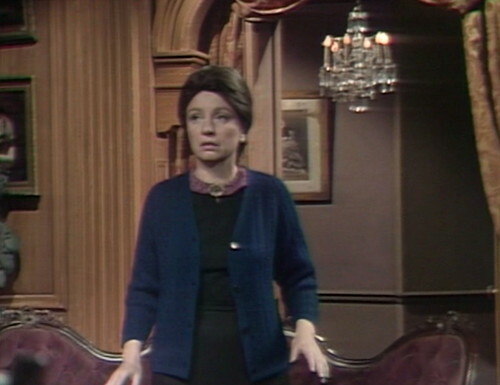 The elevator-pitch version is that Julia had a nightmare about Mrs. Johnson, the housekeeper at Collinwood, and she’s worried that if she tells Mrs. Johnson about the Dream, then Barnabas will die. Or something like that. I might need to tighten up my elevator pitch. Somebody knocks on the door, startling the conspirators. Barnabas: Who could that be, at this time of day? Julia: I don’t know… but I’m afraid to answer it. Julia: Because that’s the way the Dream starts… with a knock at the door. Now, this situation has the potential to become a real challenge for Julia. 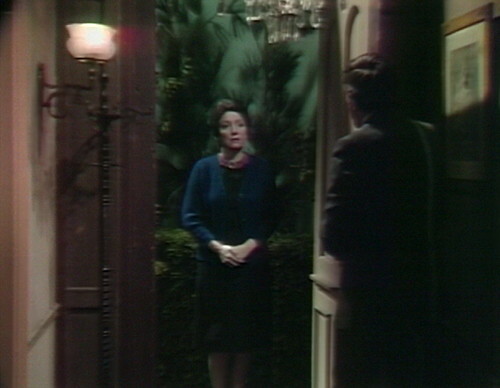 If you aren’t able to open and close doors, that pretty much disqualifies you from being on Dark Shadows. Barnabas tries to put her at ease. Barnabas: In your dream, it was Mrs. Johnson who knocked, wasn’t it? Barnabas: Well, that couldn’t be Mrs. Johnson out there, not at this hour. Then he opens the door, and guess who’s there? Mrs. Johnson! So that’s how far plot logic will get you at this stage of the game. And then there’s a close-up on Julia and a big dramatic sting, and apparently we’re supposed to accept that as a reasonable way to break for a commercial. 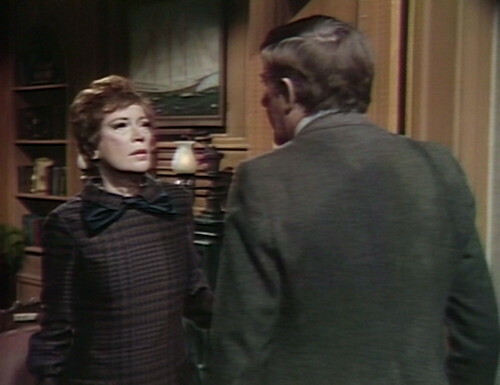 Barnabas and Julia embark on a lengthy discussion about whether she should tell Mrs. Johnson about the Dream. This leaves Mrs. J at a loose end, just standing in the parlor and staring into space like a sleepwalker. I can’t imagine that this was one of Clarice Blackburn’s most creatively fulfilling days on the show. Because this really does showcase one of the worst aspects of the Dream Curse story, which is that it reduces the characters all the way down to the minimum viable product. They didn’t even give Mrs. Johnson the dignity of an unlikely coincidence to get her onto the set. She just shows up, and openly admits that she has no character-based reason for being here. You could swap in any other character with a functioning central nervous system, and it wouldn’t affect the scene in any way. I know that I’ve spent a lot of time lately beating the Dream Curse horse, but honestly, this has got to be the laziest bit of screenwriting you could hope to find. It just gets on my nerves is all. Anyway, once that blows over, everybody hightails it to the lab to do some tampering in God’s domain. Julia pulls on the switches and twiddles all the knobs, and the performance begins. The idea here is kind of a cross between Frankenstein and that episode of Gilligan’s Island, where Dr. Balinkoff swaps everybody’s minds into different bodies. We’re using the standard Frankenstein props — spark gaps, wall switches, thunder and lightning — but Barnabas and Julia aren’t really that interested in creating new life per se. Dr. Lang was the one who was particularly excited about constructing a new creature and bringing it to life, proving that scientific mastery can conquer even death, and giving a poke in the eye to the fools at the Institute who laughed at his theories — yes, they dared to call him mad, when in fact they are the ones, and so on, and so forth. But Barnabas is really just interested in getting away from his ex-wife. He wants to fake his own death, and then stash his consciousness in another body where she won’t recognize him. I don’t think it matters to him whether he hides out in a brand-new body or borrows someone else’s. At this point, I think he’d even accept Mrs. Howell’s, if he could get away with it. 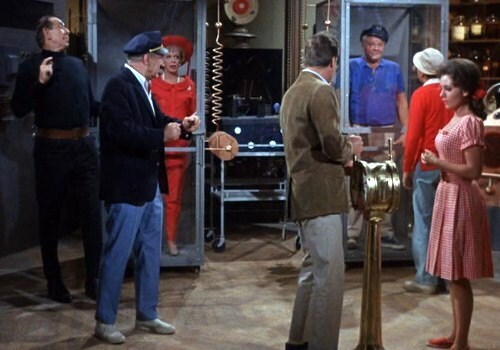 So they don’t really have the same ambitions that Dr. Lang did, but Lang’s dead, and they still have the keys, so let’s fire this baby up. Adam’s ready to roll, and Barnabas just has to lie back and do his Lamaze breathing. 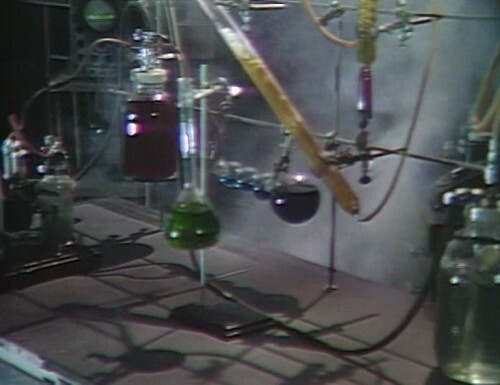 The great thing about mad science is that you can basically do almost anything, as long as it looks interesting. 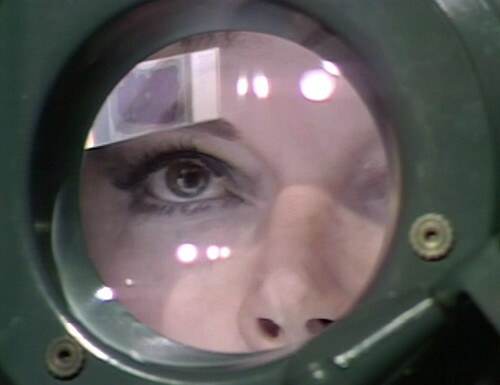 So there’s a crazy shot of Julia walking up to a magnifying lens, holding up a slide and looking at it. The lens isn’t between her and the slide — she just wants to check out the slide while standing in front of the magnifier. I’m not sure what’s supposed to be on that slide anyway. It’s all very mysterious. When they did this last week, Barnabas and Adam both had headbands that were wired up with the machinery somehow, but apparently those aren’t necessary anymore. We actually can’t see a single thing that’s connected to the guys — Julia just walks around the periphery, turning things on and keeping herself busy. 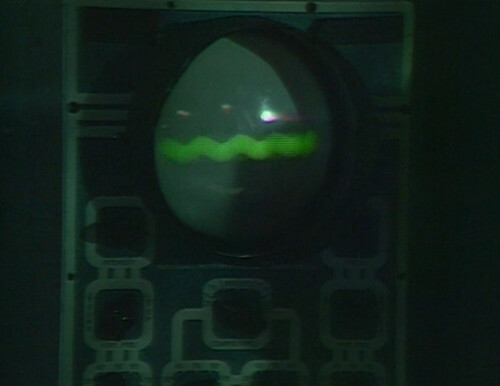 The actual transformations will be achieved entirely through the power of lighting effects. 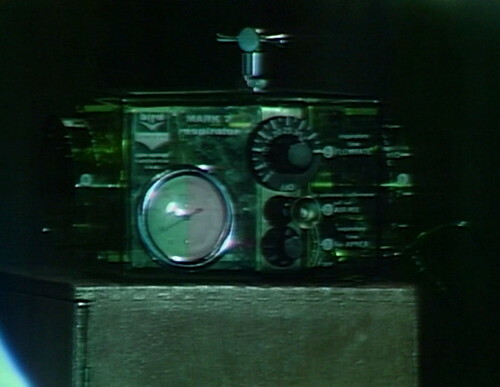 There’s a crackle and hum, and we get lots of close-ups of the equipment, including a guest appearance by a Mark 7 respirator. 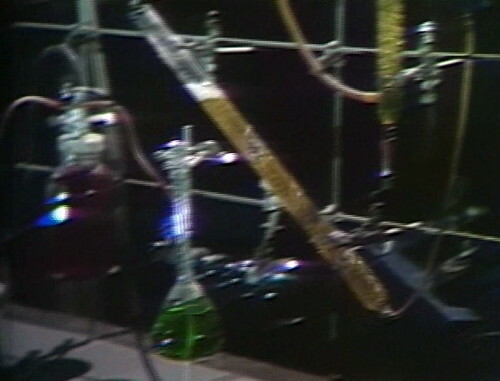 They’ve also brought in the apparatus, which Julia constructed when she was trying to cure Barnabas in the Old House basement. It’s good to see the apparatus again, I’ve missed it terribly. It’s not clear how any of this fits together, but maybe they’ve all got USB ports or something. Barnabas gasps. Julia walks over to him, and he gives her a sleepy smile. 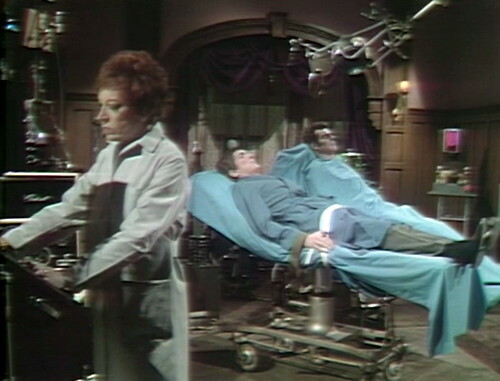 Julia: What is it, Barnabas? Julia: What do you mean? Barnabas: I’m getting weaker… I feel life slipping away from me. And he says this with a grin, like that’s the best thing he could possibly hope for. It’s one of the creepiest things that anyone has said on the show in a long time; this is a legitimately unsettling moment. And then, naturally, it all goes to hell again. There’s a little POP behind the apparatus, and the room starts filling with smoke. Julia rushes around, trying to shut things down, as more small explosions go off around the room. You know, it’s quite possible that Dr. Lang never knew what the hell he was doing in the first place. Maybe Cassandra didn’t even need to give Lang a heart attack; maybe this whole thing was a bunch of hooey and was never going to work. Has that occurred to anyone else? So we shut it all down again. Barnabas is annoyed, and he insists that Julia go and find some more of Lang’s journals, so she can figure out what they did wrong and they can do this all over again. You know, at this rate, we might have all of our Friday cliffhangers booked for months. Julia hurries off to do some more reading. Barnabas stares at the lifeless creature in the next bed, and does a super depressing monologue. 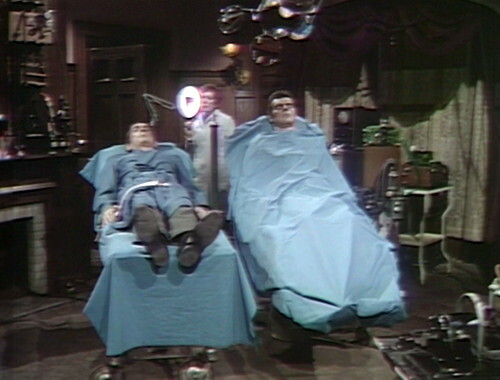 Barnabas: I wanted you to live… I wanted my empty shell to be on that table. I wanted you to be standing over me, and looking down on my lifeless body. Live! Is it not still possible? LIVE! Then Adam opens his eyes. And guess what? It’s a boy! Next: Sam Hall: In appreciation. 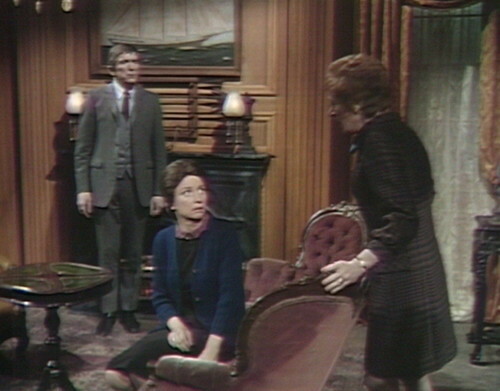 Near the beginning of act 1, as Julia follows Barnabas from the hall into the parlor, a boom mic can be seen at the top right. When Vicki says to Barnabas, “If you were, I’d never forgive myself,” she bumps into a chair. 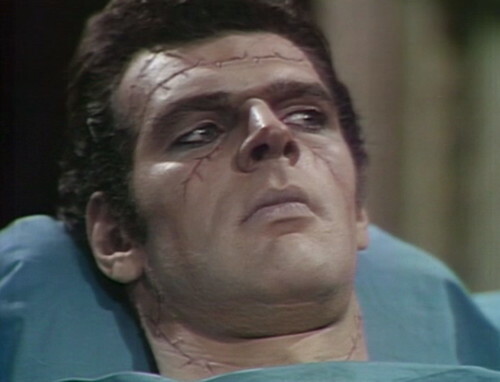 I still don’t understand how Barnabas can be so convinced Angelique wouldn’t recognize him in a new body. She travels through time and space to get to him, does he think a little regeneration is honestly going to do the trick? As others have noted, Barnabas is not a good planner. If he says he has a plan, everybody needs to start planning for damage control immediately. So his thinking Angelique won’t notice he’s switched bodies fits in with his general fail at planning. That’s not his only motivation for finding a new body though. Dr. Lang’s anti-vampire drug is wearing off so he’s looking to transfer out of the old one before it succumbs to the vampire curse again. Danny doesn’t really mention it in his summaries, but that’s one of the other reasons for the rush in the experiment. Plus which, Angelique KNOWS what Lang is up to, which is why she was poking pins in the voodoo doll and killed him (which is the real reason I love Angelique). Barnabas and Julia should really know better than to fight that koo-koo witchcraft. You know, they are in the basement of Dr. Lang’s house. Lang is dead, and everyone kows it, so how come that not only they are there, but that Mrs. Johnson knocks on the door of the dead guy, expecting to find them there???? I think having Barnabas and Julia ‘take over’ Lang’s house as well as taking many liberties around Collinwood (i.e. 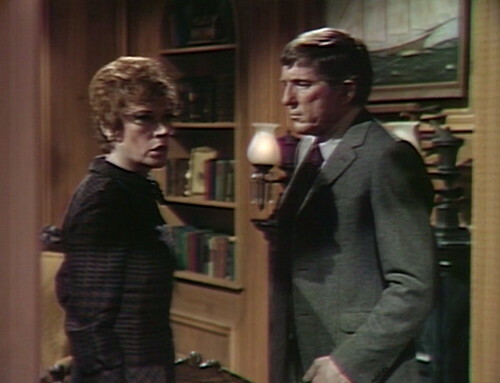 bringing a dangerous creature into the Old House) is a metaphor for the fact that Barnabas and Julia now basically ‘own the show’ and are free to do as they please. I mean, if I was Liz and I invited a ‘historian’ to stay and do research (when said historian actually lied about who she was and never told the family why she needed to become a permanent resident there) and then that person proceeded to take control of my household I would toss her out (and the horse she rode in on). Also didn’t Tony Peterson mention that Lang was his client? If so he was probably executor of Lang’s estate (it didn’t appear that Lang had any relatives). I don’t thing Lang would have had the time (or inclination) to make ‘these two’ executors of his estate. On another note, why was it necessary to hack up Adams’ face? Just so they could show the ‘cool’ scars and impress the kids who were watching, no doubt..
Well, the idea is that Lang “created” the face by stitching it together from dead people. So the stitches are still visible. Because if Barnabas can’t have Jeff’s face then he’s willing to take a hodgepodge? Did Barnabas really want to spend the rest of his life looking like a jigsaw puzzle? This storyline is loopy! Yeah, when they decided not to use Jeff’s head in episode 481, Lang said, “I can create the face, the same way I created the figure.” And that’s all the explanation that we deserve, apparently. Did Barnabas really want to be Jeff Clark? I am glad he thought that over. Minus the scars on Adam he is fine and much better looking than Barnabas in my.mind. For some reason I thought they took the entire head from an accident victim or someone who was young and died unexpectedly. But I guess Lang wanted to customize it to his own specifications. I liked that they had all that high-voltage medical equipment in the basement laboratory, and still operated by candlelight. During the Eve experiment, Julia says that she wrapped Eve’s head in bandages so that she’d be “beautiful” and “have no scars.” It’s unclear how she learned to do that, as I presume it wasn’t in Lang’s notes because Lang didn’t do it when he started the Adam experiment. However, I could be underestimating my favorite psychiatrist/hypnotist/felon. I would think that they snatched a beautiful woman, and didn’t want to take a chance on harming the face if there’s a violent wake-up. 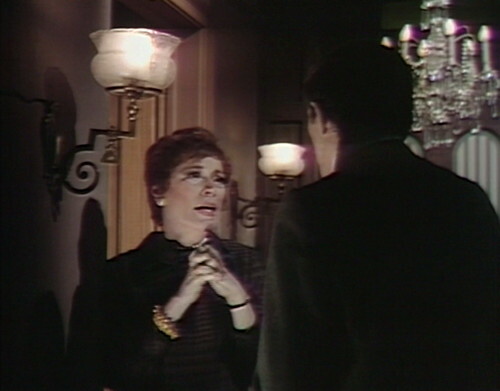 How can Mrs. Johnson be the next link in the chain if Julia and BARNABAS are discussing whether to tell her about the dream? Doesn’t that mean Julia has already told him about the dream? Now he becomes a vampire, which is already happening. I’m probably missing something here. It seems as if the rules of this cockamamie curse include the idea that to pass the curse along, you have to tell the dream to the same person that you saw in the dream. So Barnabas doesn’t count, and neither does Professor Stokes.